Does A Part-Maori Voice On Councils Have Anything To Offer? 1law4all > Councils > Does A Part-Maori Voice On Councils Have Anything To Offer? Local council decisions are (or should be) concerned mainly with providing and maintaining infrastructure for the benefit of all ratepayers and others who live in their geographical area of responsibility. For the purpose of allocating expenditure, the area is often subdivided geographically into wards. The infrastructure provided and maintained by councils includes roads, street lighting, public transport, water reticulation, drainage systems, rubbish collection, sewage disposal, libraries, sports facilities, cemeteries, parks and reserves. Maori society had no roads, no street lighting, no water reticulation, no drainage systems, no rubbish collection with recycling, no sewage disposal, no libraries (in fact, no books), although they did have cemeteries (but not for their victims!). Historically Maori society has nothing constructive to offer in regard to this infrastructure, which was developed by European settlers after 1840. The demand for special representation on councils, not because of geographical wards but because of minimal racial ancestry with no experience to draw on, gives them no more competence than anyone else – and in some cases less – to make decisions on infrastructure. Decisions which have nothing to do with the Treaty of Waitangi. One of the reasons put forward for separate racial representation is that it would bring “a Maori view of the world to the council table.” What would this be? Something like the $295 million “wish list” that Auckland’s Maori Statutory Board demanded from Auckland Council to fund specific Maori projects and which could only be paid for by a huge rise in Rates. A significant feature of Maori tribal society was confrontation and inter-tribal warfare, and that confrontation is now being directed towards Europeans. When a haka is performed it is not a welcome, but a confrontation and should be recognised as such. When preferential treatment on race has been incorporated into local body decision making it has nearly always resulted in obstructive rather than constructive influences. For example, the unnecessary (and costly) relocating of the Kapiti Expressway to appease tribal spiritualism. Then there’s the claimed, but mostly unsubstantiated, areas of tribal “significance” around Auckland. 3,660 alleged sites and rising! These areas-of-significance led the Auckland Council to set up a mafia-type situation in their Unitary Plan. I.e. Residences or businesses in or near these areas have to pay what is in effect protection money – sometimes to several different tribes – to do any constructive development or alterations or improvements on their land. Those payments are in addition to the usual resource consents. If that sounds like a decadent and corrupt system, it is no better than the people who run it. One wonders do these reverse racist councils which for some inexplicable reason recognise the existence of a mythical beast from Maori folk law recognise and accept the existence of a Christian God? I doubt it the gutless b_____ds. Modern part-Maori or indeed people of any ethnicity do have something to contribute – through the democratic process, like everyone else. They have nothing ‘special’ to offer – that’s the myth that they wish to propagate. Everyone may have something to offer, but it has to be based on fact and need without any racial bias. If part- or full or whatever Maori want input at council level then, like central Govt., STAND FOR ELECTION. You can’t get rid of unelected officials unless they commit a crime. Another scam from people who see rates payers as cash cows who can’t be bothered or get organised enough to stand up for themselves. Correcting these issues takes monumental effort as most readers of this site well know. Reference is made, in the third paragraph, to the maori view of the world. Until the coming of Europeans, the maori ‘world view’ was limited to what they could see to the horizon. No one has been able to explain just what the Maori ‘world view’ is, although it is often mentioned. The “maori view of the world”…..the very same one that wiped out Moas, Huias, Haast Eagles, Morioris, and murdered, raped, ate and enslaved each other. The view that had no alphabet, no numerical system, no wheel and were a stone age, barbaric culture going nowhere. I think an investigation within the NZ Historic Places Trust might find out that there are more people having to hand over some dosh to be allowed to build. Ask the Archaeologists there for an off the record rundown and you might be surprised how many people have been affected. It’s called extortion and people are too scared to say. What is a Maori? (Or part-Maori?) They were a group of tribes / people that came from separate places at separate times and landed at different areas and were given the name Maori to make them into a collected group in the 1800s. They are of European decent and are now used to getting handouts and votes. Percentage of part-Maoris? 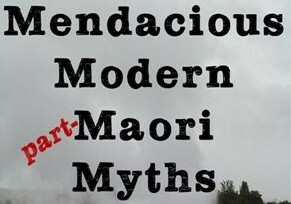 Supposedly, there are no full-blooded Maoris alive, today, in NZ.